Plymouth Schools’ FA was founded in 1903 and a year later was a founder member of the English Schools’ FA. When a trophy competition was inaugurated by ESFA, Plymouth was excluded because it was too far to travel. The U11 squad has enjoyed a great run of recent success, winning back-to-back Cotswold League titles through the 2015/16 season and the 2016/17 seasons respectively! 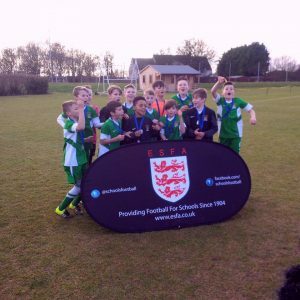 In addition to this, the two squads managed to reach the Premier League National 9v9 finals having won the South of England qualifying tournament! The U11 squad was also nominated for Plymouth Herald Team of the Year in 2016. Four seasons ago the Association won the U15 Trophy for the first time, and in our centenary year too! That U15 Squad was also named team of the year by our local evening newspaper in their annual sports awards in December 2003 and presented with their award by Willie John McBride.Other successful years in the competition were 1953 and 1989, reaching the semi-final on both occasions.